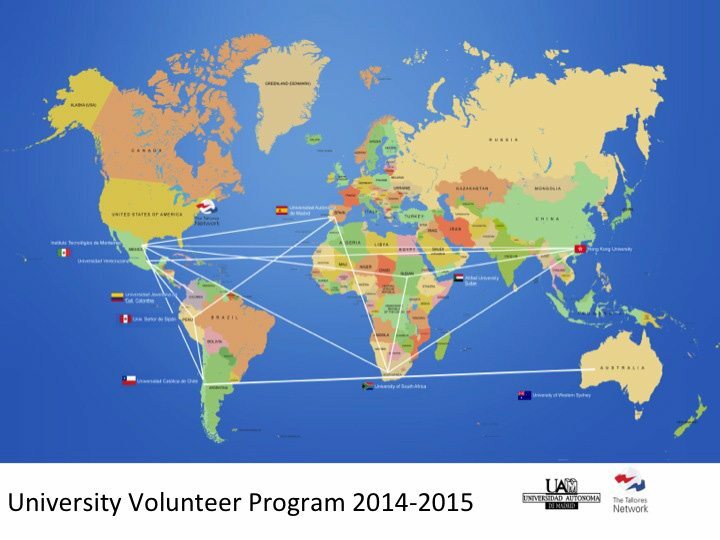 During 2013-2014, The Talloires Network (TN) and Universidad Autónoma de Madrid (UAM) ran the pilot University Volunteers Program, funded by Santander Group. The overarching goal of the Volunteer Program is to promote global civic engagement and community building through the international exchange of student volunteers from among the Talloires Network’s member institutions. The program aims to instill long-term values of civic engagement and social responsibility in the volunteers so that they continue to contribute to their local communities and apply their experiences wherever they may go. The structure of the program also strengthens partnerships between Talloires Network member institutions through the international exchange of student volunteers. The first edition was a great success, with ten volunteers completing their assignments, three of whom had the opportunity to talk about their civic engagement projects at the Talloires Network Global Leaders conference in Cape Town, South Africa in December 2014. As a result of the positive feedback and successful volunteer assignments, we are pleased to announce that the 2014-2015 second edition of the University Volunteers Program has now begun, with 9 universities from Africa, Asia, Latin America, Spain, and for the first time, Australia. A total of 17 volunteers will be completing their volunteer assignments this year – six from Mexico, four from Spain, two from Hong Kong, two from Chile, one from Colombia, one from South Africa, and one from Sudan. Due to the diversity in geographical sites and student interests as shown in the map above, the volunteer assignments cover a wide range of critical issues in each community, ranging from combating violence against women in Sudan and training health workers in South Africa, to assisting in the development of a business and marketing plan for rural populations to sell their handmade products in Mexico. Please check our section on featured volunteers who participated in the first edition of the program. Download Frequently Asked Questions (FAQ) about the University Volunteer Program. If you have any further questions, please send us an email: TalloiresNetwork@Tufts.edu andinternational.volunteer@uam.es.